Get ready to deck out your kids’ room in stripes and pom-poms: Today, designer, tastemaker, and ultra-stylish mom, Margherita Maccapani Missoni Amos, launches an exclusive new collection with Pottery Barn Kids. Spanning bedding, décor, and nursery essentials, the line is filled with sweet daisy prints and brightly hued geometric patterns, making for décor that parents and children will equally love. 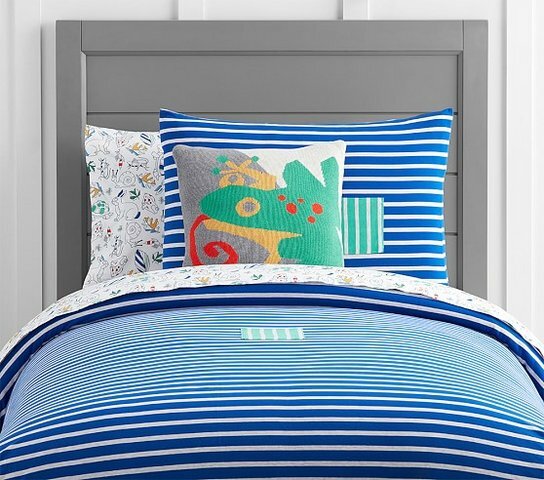 This playful collection evolved naturally for Amos, who has two sons of her own and surely knows a thing or two about designing a cheery kids’ room. Below, Amos shares some of her favorite ways to decorate a children’s space—though much of her stellar advice could be used for any room, actually. Mix color, texture, and pattern. In addition to the heaps of toys and books that oftentimes end up accenting a child’s room, it’s important to bring in some meaningful décor elements. “In Italy, we have a tradition of giving hand-embroidered or cross-stitched wall décor to newborns,” says Amos. Whether it’s a few framed family photos or a piece of heirloom furniture, blending sentimental décor items makes for a richer, more personalized room. While beautiful linen blankets and crib décor with laced scalloped edges can be quite tempting, it’s simply not practical—spills and stains are bound to happen. Amos recommends waxed cloth for the dinner table and in the nursery she sticks to easy-to-wash natural fibers, like cotton for bedding and wool for rugs. Create a joint style for shared spaces. If you have (or plan to have) more than one child, chances are they are going to share a room at one point or another. While there may be a mutual request for bunkbeds—because they really are that fun—there will be discrepancies in their personal styles and how they’d like to decorate. “Right now my children are very young, so they share a room. I’ve been decorating it in a joint style that reflects both of their unique personalities,” says Amos, who recommends keeping cohesive design elements throughout the room (think: color palette, repeating pattern, or matching storage baskets) that will tie the space together despite respective personal styles). Donate old toys, clothes, and décor.